LATEST UPDATE: The US Congress recently passed a bill (WRDA) allocating funds to build the seawall. We are currently losing this battle! Instead of simply moving the Montauk Point Lighthouse, the US Army Corps of Engineers wants to build an 840 foot long seawall that will extend into the area known as Turtle Cove. This expansive project could dramtically impact this fragile ocean environment – without accomplishing the goal. NY Times Science editor Cornelia Dean summarizes the situation and the potential damage that could be done by this risky plan. Installing a new seawall expends political capital as well as taxpayer’s money on a temporary measure that offers no guarantees. The ocean and especially ocean storms are full of uncertainty. This money would be more wisely spent on a permanent solution. Moving the lighthouse safely back from the bluff, could provide safety and security with no significant environmental cost for next 300 years! There are hundreds of residential and commercial buildings along the south shore of Long Island that are quickly becoming too close to the ocean and in danger from coastal storms. All these building are as important to their owners as the lighthouse is to the Lighthouse Committee. If the government moves ahead with this controversial, high profile project, other landowners are encourage to search for the same solution for their coastal property! East Hampton is in the process of adopting legislation banning such hard structures within the township. One of the over arching aims of the ongoing, multi-million dollar “Fire Island to Montauk Point” (FIMP) study (a study being conducted by the Corps.) is to find ways to move away from shore hardening practices like the stone seawall proposed for the lighthouse. The evidence is overwhelming that these structures lead to accelerated erosion of adjoining shores lines. The US Army Corps final environmental impact statement admits that quote, “ While the proposed seawall alternative will continue to limit the coastal erosion at the Point protecting the Lighthouse complex, forces such as the tidal currents and waves will continue to erode the north and south down drift shores continuing the curvature process, especially immediately adjacent to the seawall.” If we keep adding more and more seawalls as the land next to the new stones erodes quicker and quicker, aren’t we just going to eventually create an island out at Montauk Point? Let the Lighthouse represent man’s respect for the ocean rather than his constant misguided efforts to control it. 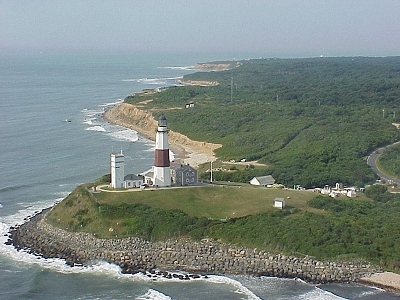 Why Are Montauk’s Beaches getting so small? Could the reason be that putting rocks in front of the lighthouse to protect it in the 1940s and again in the 1990s has stopped the natural erosion of material that should be replenishing these beaches. The answer is ‘yes’ in part, according to a US Geological Survey document: “Today, the sand and gravel eroded from the headlands at Montauk and from the massive sand reservoir offshore (originally derived from the moraine and outwash) are the primary sources for sand on the beaches along southern Long Island.” (full document at: http://3dparks.wr.usgs.gov/nyc/parks/loc65.htm). The Corps. went back and lightly touched on this issue after Surfrider Foundation expressed concern upon reviewing the draft environmental impact statement (DEIS). Could this lead to another one of the Corps’ infamous ‘unintended consequences’? Long Islanders have too much at stake when it comes to our beloved ocean beaches. Risky coastal seawalls, full of potential uncertainty; is this a chance we are willing to take? Instead of piling more rocks in front of the lighthouse as planned by the Army Corps of Engineers, the lighthouse could be moved. Other prominent, historical lighthouses in the Northeast have been safely moved, for example: Cape Hatteras, NC – Block Island, RI and two in Cape Cod, MA. In each case it was decided that, although initially more expensive, moving the lighthouse was the only guaranteed long-term solution, and in each case tax payers for many generations to come will end up saving many millions of dollars. In light of all the questions regarding this Corps’ proposed seawall, have we given this option the consideration it deserves? Please check out our official position paper for a more in-depth analysis.